The Bible and Economics: Will There Be Inequality in Heaven? "If the work that anyone has built on the foundation survives, he will receive a reward. If anyone's work is burned up, he will suffer loss, though he himself will be saved…" (1 Corinthians 3:14-15). It used to be said that the goal of a fair and just society ought to be "equality of opportunity," but somewhere along the way we supplanted that noble goal for a twisted, utterly arbitrary one. "Equality of outcome" is the new rallying cry for millions of Americans engaged in social, political and economic activity. Loudest among them are a growing number of what I consider to be "my people"—self-described evangelicals who attend weekly church services, believe in the authority of scripture and genuinely care about finding ways to aid "the least among us." Well-intentioned and sincere, many Americans across the theological spectrum have embraced a collectivist, redistributive view of political power, in my opinion, simply because they have hurriedly connected biblical truths related to wealth, justice, helping those in need, storing treasures in heaven, etc., with a liberal philosophy. I believe many Christians have an aversion to free enterprise and entrepreneurial activity and have shifted to the Left on economic policy because they believe God is intolerant of inequality. They might say, "Why should I actively or even passively support an economic system that requires some end up with less than others?" 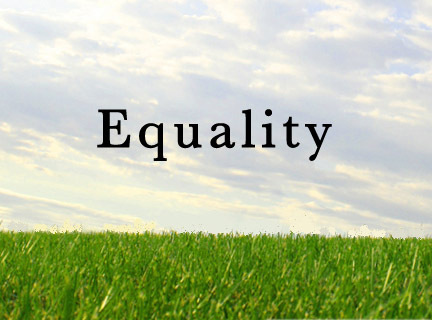 The variations in the meaning of "equality" have direct ramifications on how we think about the world around us. For example, most God-fearing Americans agree that we’re all equal in God's eyes. We're all unique individuals made in the image of our creator. This truth reminds us that we should treat each other with dignity. You don't have to be a religious person to agree with the general moral principle in play here. But when someone says "We’re all equal in God’s eyes," it does not follow that everyone is exactly alike. It does not mean there is no distinction between a father and a son, a boss and an employee, or a pastor and his congregation. Fathers are to instruct and love their sons, while a son is to respect and honor his father. Bosses are to treat their employees fairly, and an employee is to work for that boss to the best of his ability. According to scripture, pastors are held to a higher standard because they have been entrusted with the public teaching of God's word. This fact of differentiation and distinction doesn't make the pastor a "better Christian." It doesn't give the boss carte blanche to intimidate and mistreat his workers. And a father who abuses or neglects his son will have to give an account of his actions one day. Even among celestial beings, God gave different angels in heaven different roles to play, with varying degrees of reward and accolade. Lucifer was described as the most beautiful, worship-inducing creature before his monumental fall from grace. In the Old Testament, Yahweh picked a "chosen" people for His plan to redeem the human race. Jesus picked 12 disciples and chose certain ones to serve as leaders among the others. If God were as obsessed with some vague concept of "equality" as many liberal Christians are today, He sure has had an odd way of showing it for more than 6,000 years. But—you might say—aren't you just cherry-picking biblical concepts to try and lead a bunch of horses to drink your supply-side, free-market-flavored water? Isn't this more of the "forcing your politics into religion" stuff that everyone accused the Religious Right of doing in the 80s and 90s? By no means. Look at the parable of the talents in Luke 19, where wealth is unevenly distributed and where the poorest of the three men is condemned for lazily squandering his opportunity. Look at Matthew 20 and the parable of the workers in the vineyard, where the landowner unevenly distributes work and compensation and silences those who complained by reminding them that it is his land, his money and his decision to do what he wants with both. Or how about the verses I cited at the beginning of this piece? Even in heaven, even among those who will spend eternity with God, we will have to give an account for the way we live and how we spend our time, energies and emotions. Not all will be treated the same. God isn't concerned with strict equality. And inequality of wealth isn't the problem. We are the problem. Man's fallen state is the problem. Tearing down the "rich" does not help the poor, but it can hurt the poor. We all want people to be able to provide for themselves and their families. We want those who were previously in need to be able to one day become the person who helps another struggling family. This requires wealth creation, which in turn requires the private sector have room to flourish. If we have to "choose between unequal prosperity and shared poverty," I'll choose the former.